He went from being a radio personality to a TV superstar, with his hate-speak and political lies, ultimately driving the course of political movements with his disinformation, empty rhetoric, and outright falsehoods, until he was brought down when his redneck public discerned his ultimate snake-oil shallowness. If you think I’m talking about Glenn Beck, I am. It’s also the story of Larry “Lonesome” Rhodes in A FACE IN THE CROWD. Political monolith Keith Olbermann piqued my interest in this movie by constantly referring to asinine political commentator Glenn Beck as Lonesome Rhodes Beck. Olbermann would occasionally cite the movie from whence he drew the analogy. In this 1957 film, written presciently by Bud Schulberg and directed kinetically by Elia Kazan, Andy Griffith is Larry Rhodes – a Brando-esque titan from his first seconds onscreen. You heard me: this is not the Andy Griffith from Mayberry NC whom everybody loves for his suffocating kindness and goodness. 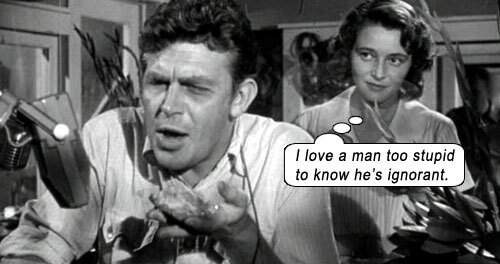 Rhodes is a rough-hewn black diamond that Griffith carved from battery acid and demon seed long before Opie and Barney and Aunt Bee turned him into, well, Andy Griffith. At first it’s all catchy songs and down-home stories. Rhodes: “I put my whole self into everything I do!” His rise to fame is meteoric: a ship is named after him, a mountain, awards, until he’s bigger than the Beatles who were bigger than Jesus. After he starts believing his own myth, he starts exploiting his power: “I’m not just an entertainer – I’m an influence, a wielder of opinions, a force!”… “My flock of sheep, rednecks, crackers, hillbillies, housefraus, shutins, pea-pickers; everybody that’s got to jump when somebody else blows the whistle – they’re even more stupid than I am, so I got a thing for ’em…” Lonesome’s hubris, coupled with his inborn ignorance, would be his downfall. See Glenn Beck. Walter Matthau is newspaperman Mel, a conscience whom Marcia desperately needs when her reality slips under the cogs of Lonesome. 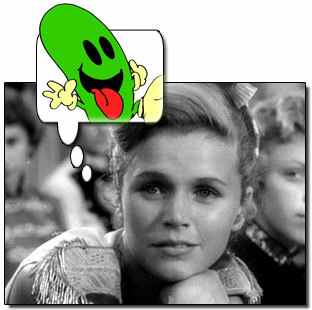 Lee Remick, her eyes like diamonds aglow, is the most beautiful girl in the world at this point in time, and a teen fling for Lonesome. The film is also intrinsically racist in all those subtle ways that we forget are racism for their accepted ubiquity: The owner of a radio station has a black man polishing his shoes near his desk as he listens to Lonesome; owner scruffs the black man’s hair, “You like him?” “Yessuh ah do!” Look at the dominant-subjugated positioning of these two; look at the infantilizing attitude of the white guy. That black guy might as well be a slave – he might actually BE a slave! In real life! A FACE IN THE CROWD is indeed prophetic, as it portrays Lonesome’s popularity decline exactly as his real life avatar’s popularity declined. Thankfully, like Lonesome Rhodes, Glenn Beck would become just another face in the crowd. Starring: Andy Griffith, Patricia Neal, Anthony Franciosa, Walter Matthau, Lee Remick, Percy Waram, Paul McGrath, Rod Brasfield, Marshall Neilan, Alexander Kirkland, Charles Irving, Howard Smith, Kay Medford, Big Jeff Bess, Henry Sharp.